ISA International Sign Expo 2015 will be April 8-11 at the Mandalay Bay Resort and Convention Center in Las Vegas, and this event is once again shaping up to have the most exciting tradeshow floor in the sign and visual communications industry once again. 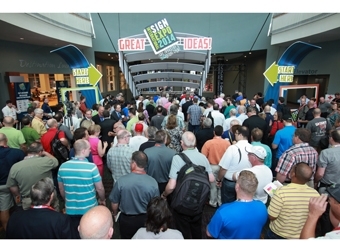 • The tradeshow floor will be the largest in ISA International Sign Expo history, at 215,000 net square feet. • Dozens of the industry’s leading suppliers and manufacturers have announced plans to release new products on the tradeshow floor, with those products representing the range of the industry. • The Dynamic Digital Park will be more than 35 percent larger this year than in 2014. Now in its third year, it has grown at least 35 percent each year. The DDP will house the top exhibitors in the rapidly expanding dynamic digital signage field. Many of them will provide free education sessions in the park, as well. • Print Application Center, in conjunction with Graph Expo and My Print Resource, includes live demos from Anajet, Mimaki, and Mutoh, as well as hands-on solutions and education sessions designed to address the most pressing print issues. • Print with Compassion launches at ISA International Sign Expo 2015. This program, from Mimaki, uses hands-on demonstrations to create products that will be put to use by kindergarten students in the Las Vegas area. • Lounge & Learn offers an opportunity to connect with some of top thinkers in the industry. These thirty-minute sessions will focus on question-and-answer segments, allowing attendees to have these leading experts address their specific needs. • A variety of networking opportunities occur on the tradeshow floor, including the Last Hour Happy Hour, which closes the floor each afternoon. • A mobile app, sponsored by Nova Polymers, will help attendees map out their schedules, find exhibitors, and connect with attendees. The app can be downloaded at http://signexpo.org/mobile-app-2/.